DEVIL IN THE FLESH, Part One The legendary fallen angel returns to comics. As New York Citys sins are covered with a fresh blanket of snow, the psychotic serial killer, Torment, is hard at work creating new ones. Meanwhile, Avengelyne has her hands full with the Red Dragon who has taken a human vessel in search of a new apprentice. Who has the Dragon chosen as his vessel and does it have anything to do with Avengelynes new look? All this plus the introduction of the stunning, Heaven Starr! 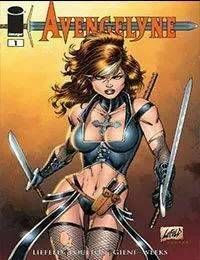 AVENGELYNE is a new ongoing supernatural series written by MARK POULTON (Koni Waves) with art by OWEN GIENI and letters and color assists by DEXTER WEEKS.